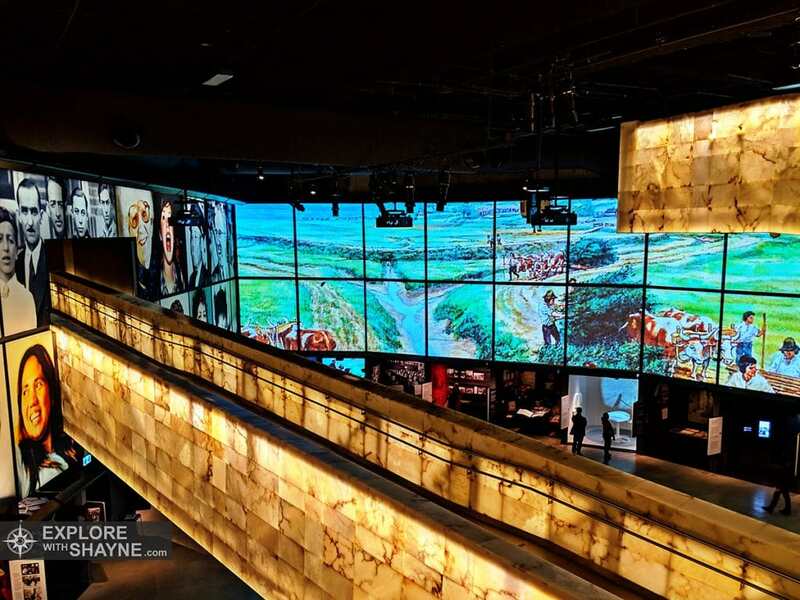 Where the Red River meets the Assinaboine, in a city formerly known as the gateway to the west, lies a gargantuan conglomerate of brick, concrete and glass. 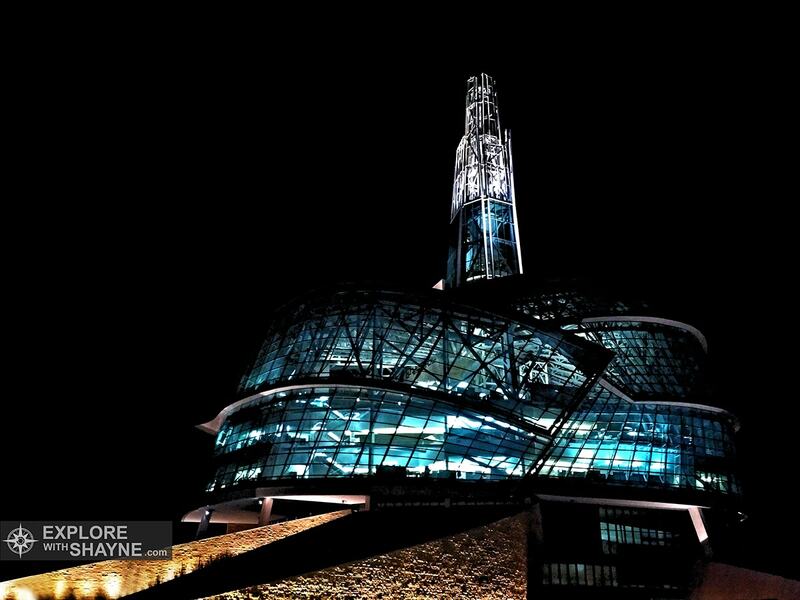 Not far from the snow and wind-swept intersection of Portage and Main, situated on an area of land known as The Forks, an architectural monument dedicated to human rights, bursts forth from the Winnipeg cityscape. The Forks, a national historic site, was a seasonal migration route for Nakoda, Cree, Ojibwa and Sioux Aboriginal groups for over 6000 years. European fur traders built forts and trading posts here, and introduced the aboriginal population to both European culture and smallpox. In the 1800’s The Forks became a landing point for immigrants to western Canada. Today the people migrating thru The Forks are not fur traders, gathers or hunters, but a mix of tourists and locals looking for food and entertainment. 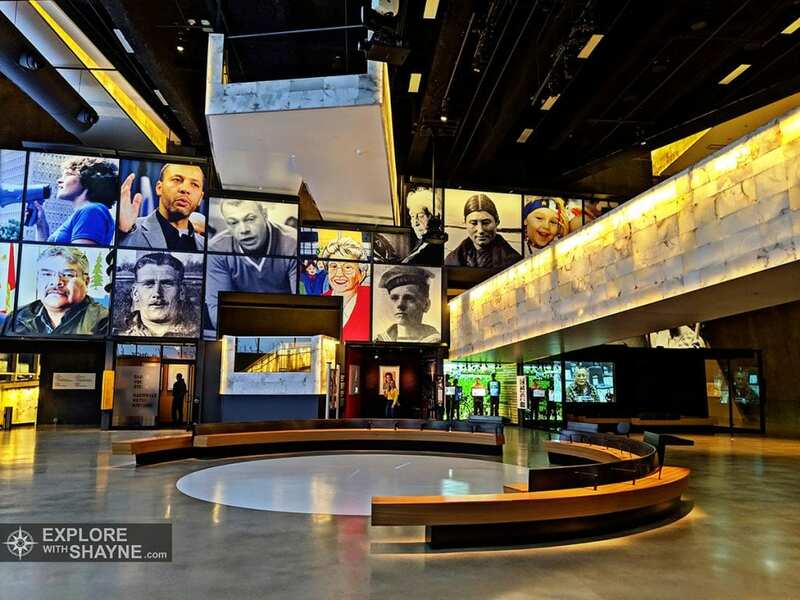 Perhaps it is fitting that the Museum for Human Rights was erected on land that has witnessed Manitoba history. After all, who could argue with enshrining history and culture on the grounds of such a historic place? As it turns out however, this monument to human rights is in some ways contradictory. While not as contradictory as an alcoholic who is trying to drink himself sober, there are a few inconsistencies. 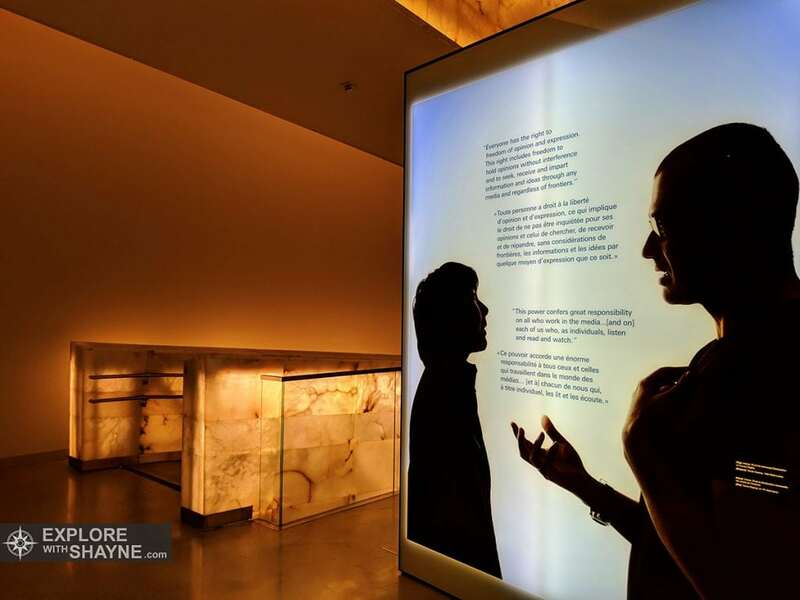 First Nations groups have claimed that the Museum for Human Rights was built upon native burial grounds. While archaeological investigations did commence before excavation had started on the museum, only 3% of the area the museum sits on was examined. 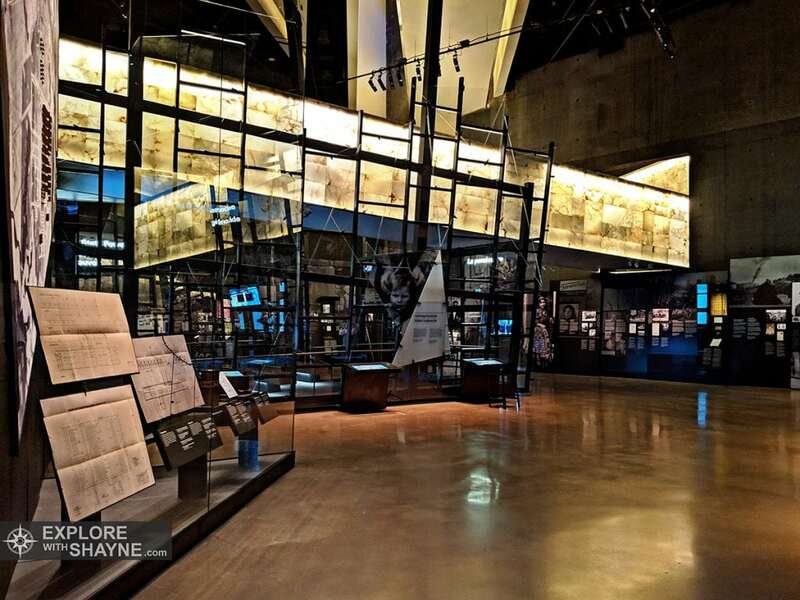 Some would argue that out of all the exhibits in the Museum for Human Rights the most important would be to exhibit due diligence when examining these claims. While the museum failed here, they do offer free admittance for anyone carrying an Indian status card. According to the the museum website, they chose to adopt this policy because “all human beings are born free and equal in dignity and rights.” Though this too isn’t without controversy. While the Museum for Human Rights’ origin and entrance policies may be controversial, its contents are not. 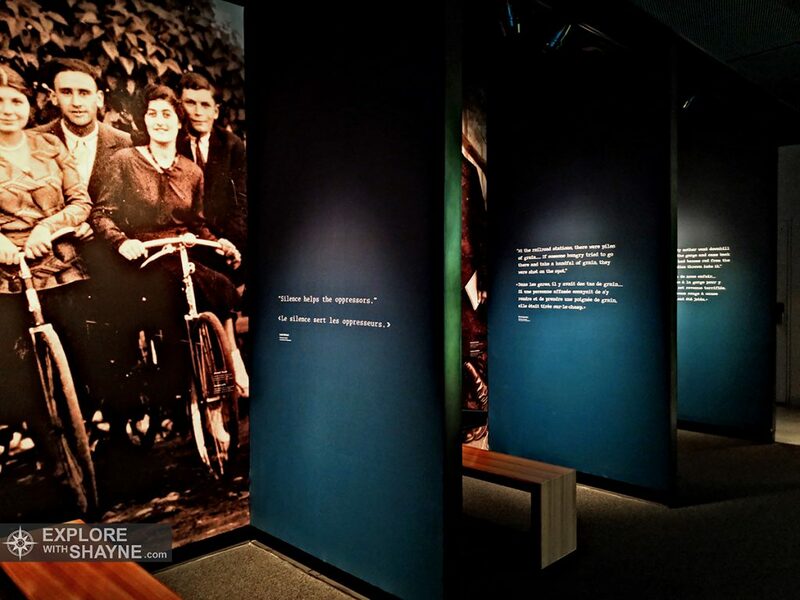 The museum takes you on a historic journey thru past human rights abuses. Its historic walk thru the decades is an intriguing and honest look into the hardships certain groups of our society have faced. 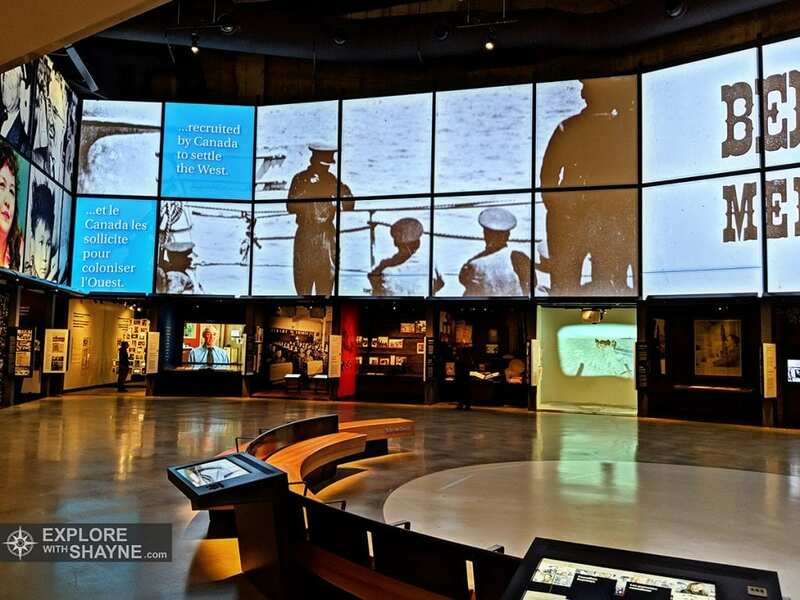 Content in the museum spans throughout history. Covering almost everything from First Nations perspectives on human rights, to the Holocaust to the modern-day feminist movement. The horrors of residential schools and Japanese internment camps are on full display for all to see. Upon reaching the upper levels of the museum, the topics begin to change. Instead of dark and depressing tails of horror, it turns to an intriguing look at the importance of human rights, and how we can ensure that all humans are protected. 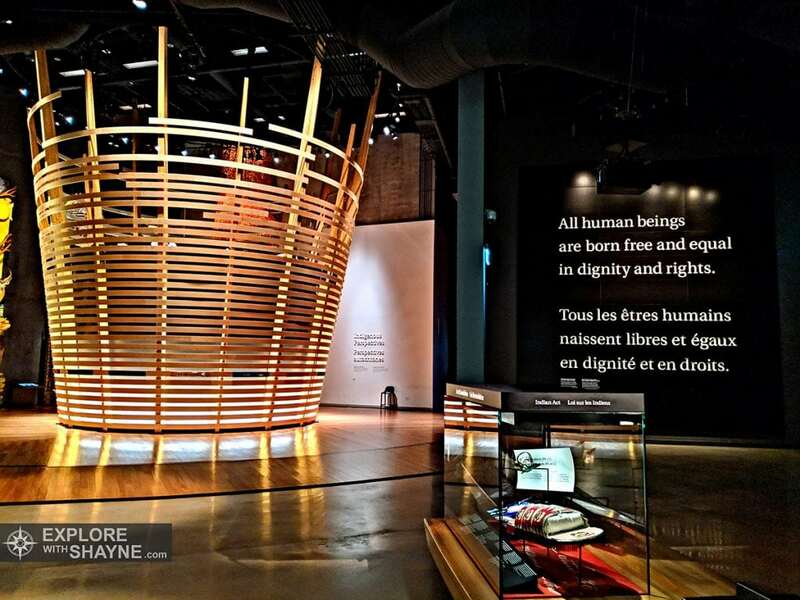 On one of the museum walls the Canadian Charter of Rights and Freedoms is displayed which includes the phrase “Everyone has the following fundamental freedoms…. Freedom of thought, belief, opinion and expression”. 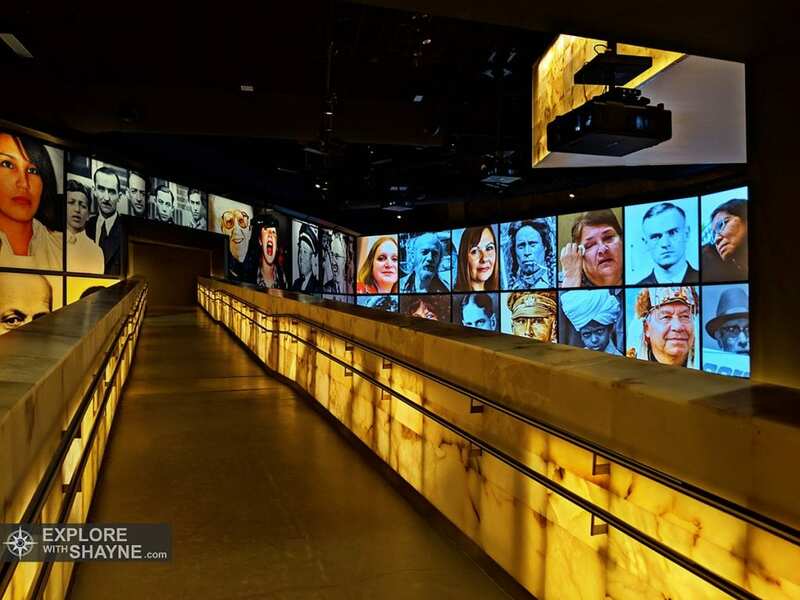 Not far from here an interactive exhibit allows visitors to vote on a series of questions relating to human rights. One of the questions asked “should there be limits placed on free speech?” Ironically, only a few meters from where the Canadian Charter of Rights and Freedoms is displayed, over 20 percent of people voted in favor of limiting these rights and freedoms. After passing this exhibit, and moving on to the next floor, an old 1970s TV can be seen, and the iconic words “just watch me” can be heard mumbled by Pierre Trudeau. The seventh, and last floor, is different than the others. Here museum visitors are given the chance to have their voice heard. Each visitor is given a card on which they can write what they would do to preserve and protect human rights. Visitors thoughts and opinions are then displayed on the wall for all to see. 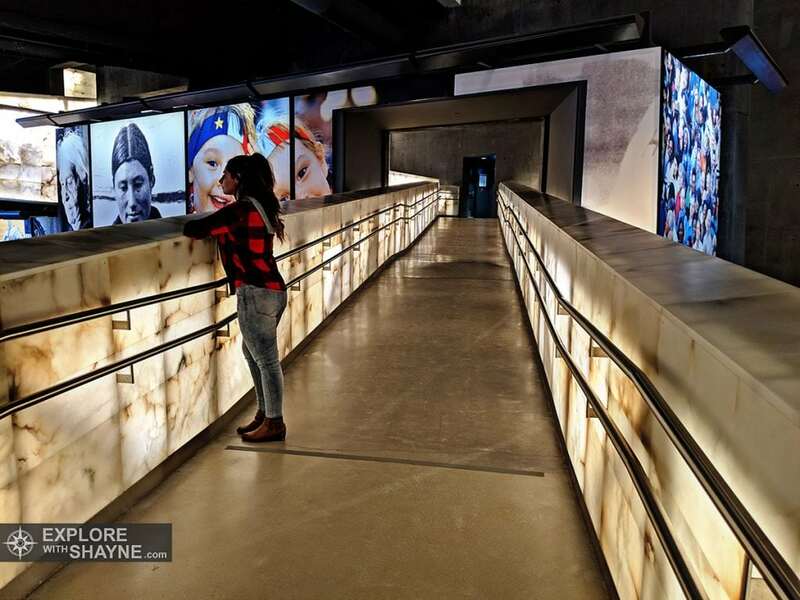 Finally, after viewing all seven floors and walking over one kilometer of alabaster-clad ramps, visitors get to climb up the Asper Tower of Hope. 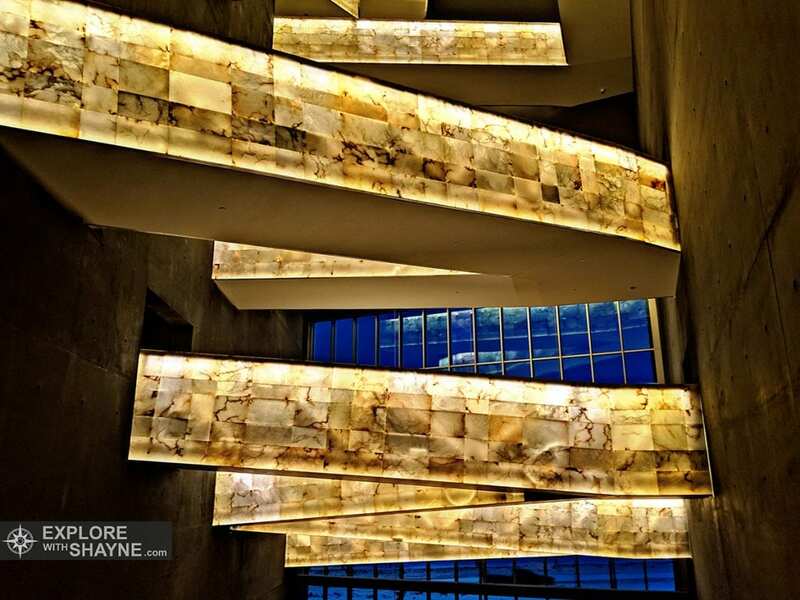 The upmost point of the tower is 23 stories above ground level. Peering out the Windows gives a good view of the city lights and eroded Winnipeg architecture, which one could view as resembling the state of human rights in Canada. The glowing lights resemble the promises of hope in tomorrow, while the crumbling infrastructure is a reflection of how easily human rights can crumble if they aren’t actively preserved.